I think one of my favorite parts of Walt Disney World is the food. I love the variety of food that is offered at Disney. There are so many options that there is something to please every taste bud. A few years ago when our family visited Walt Disney World, we purchased the Dining Plan. We didn’t purchase the small Dining Plan, we purchased the big Dining Plan that offered 1 lunch, 1 snack, and 1 dinner. It was amazing and worth the money that we paid. With this amazing dining plan, we discovered a lot of amazing and not so amazing restaurants, so in an effort to help those that may not have visited Walt Disney World or are on the fence of where to eat and where not to eat I compiled a list of my top 5 Walt Disney World Restaurants Worth Skipping. I cannot count the number of restaurants we’ve dined at while visiting Walt Disney World. Every time we visit the parks, we always try and experience new restaurants, but of course, we have our favorites that we find ourselves going back to. My top 5 Walt Disney World restaurants that I think are worth skipping or trying later when you have more time are from my personal experience. San Angel Inn Restaurante– Some may disagree with me but speaking as a girl from Texas, home of the best Mexican food ever, I think that this is a restaurant that is worth skipping. The ambience is great, a little too dark, but does not get my taste buds excited. I may feel this way because I am from Texas and have had a lot of amazing Mexican food. Mama Melrose’s Ristorante Italiano– Once again the ambience of Mama Melrose’s is awesome but once again, I didn’t get that ‘I have to come back’ feeling. The food is good, but like most Disney restaurants it is overpriced and does not make my taste buds excited. If you want to eat Italian food while you are visiting Disney, I recommend Via Napoli at Epcot. The Crystal Palace– The Crystal Palace is a character dining restaurant, which is great for kids. The characters visit every single table and interact with your kids and the food is ‘kid friendly’. With that said, if you don’t ‘have to go’ then I would skip it. If your kids are not interested in meeting Winnie the Pooh and his friends, then I recommend that you enjoy another Disney restaurant. Hollywood & Vine– This is another character dining restaurant that is geared for kids. I will be brutally honest, even if you have kids, I would skip this restaurant and choose a different character dining restaurant. As with most buffet style character restaurants the food selection is geared for kids, which is great, but when we went, the establishment seemed dirty and not up to Disney’s standards. The food was bland, but the desserts were great. As a Disney lover, I think that there are better character dining places to eat and the Hollywood & Vine is worth skipping. Sci-Fi Dine-In Theatre– My family experienced Sci-Fi Dine-In Theatre years ago and we each walked out looking at each other thinking the same thing. This restaurant was totally worth skipping. The food was not spectacular and the service was not good. I know that years later I either read that someone suggested they get new management or that they did get new management. If you like Sci-Fi and the feeling that you are in a drive-in movie theatre, the ambience is great, but the food is not worth the price. My second favorite reason to visit Walt Disney World is the food. 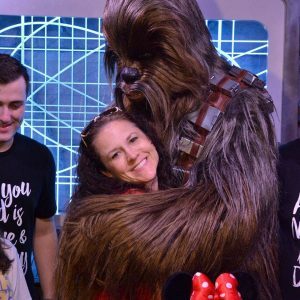 I have had more good experiences than bad and most Disney restaurants are spot on but there are some, as I listed, that are worth skipping for one reason or another. Of course, if you have the time and money, then you should always experience these restaurants for yourself but if you are short on time and want the value of your money to go towards something you will not regret then I recommend that you skip these restaurants. What Walt Disney World restaurants do you recommend skipping and why? 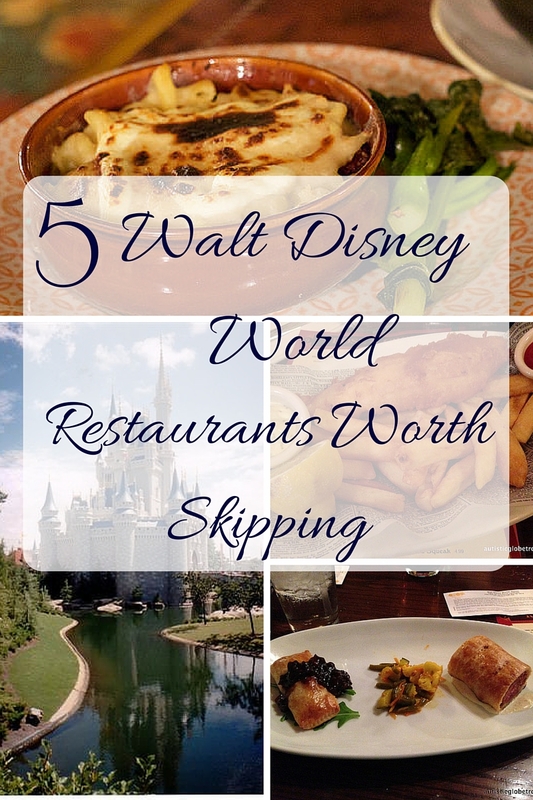 Also, take a look at my 5 Walt Disney World Restaurants NOT Worth Skipping. Do you love Disney like me? If so, take a look at some of these fun Disney posts: 5 Disney Inspired Themed Party Treats, 5 Amazing WDW Character Dining Restaurants, Why Disney’s Art of Animation is NOT For Me, What to Skip at WDW, 5 Must Do Attractions at Epcot, What Not to Buy at Walt Disney World, 5 Things I’ve Never Experienced At Walt Disney World, and more. I agree with Sci-Fi. I went there years back when I was in middle school (I’m now in college) & was so excited after seeing pictures of it. I expected the food to be average but we were all very disappointed in the food quality. We love Sci-Fi! We’ve gotten good food there on more than one occasion, and my two boys love the atmosphere. I can’t remember the service on our previous trip, but we had a fantastic server there just a couple of weeks ago. We also did Crystal Palace on our recent trip for the first time. Everyone in our family was happy with the food, the setting was quite nice, and we liked our server. It was our last meal of the trip, and we thought it was a great way to end a wonderful visit to our favorite place. While, I do think the repetitive blah sci fi movies were a little boring for the kids, I remember the food I got at the Sci-Fi drive in as being spectacular and the kids liked sitting in the car. I guess it all comes down to what you order. For desert I think I ordered the turtle cheesecake–delicious!! I don’t remember what my meal was, but I do remember it was quite good. I agree with most of your list and I know that everyone’s palate’s are different…… But Mama Melrose???? We are Italian, at least my husband is, and we absolutely loved the food and the ambiance!! Now, let me clarify, we are not an Olive Garden type of Italian!!! The food is overpriced in most all of Disney, so we don’t count that against anyone!! That being said, so worth trying this place!!! You are killing my soul with this post – I LOVE San Angel Inn. We eat their every trip! Now, I love me some Tex-Mex, don’t get me wrong, but San Angel has what I would consider more “traditional” Mexican food. My husband is Mexican and this is the kind of food his family cooks. That being said, we don’t eat here for the food, but for the ambiance. I love the lighting and the feel of being outside on a summer day…and you can’t beat the view of the volcano lit up while you eat. I haven’t eaten at the other restaurants you mentioned, but I’m a little nervous because I made ADRs for Crystal Palace, Sci-Fi, AND Hollywood/Vine. I don’t expect much from Hollywood and Vine but my 3 yr old would be crushed if we missed the Disney Jr characters. I’m most looking forward to a reservation I made at Sanaa at Animal Kingdom Lodge. I think because we are living in San Antonio we eat so much authentic Mexican Food that I can live without San Angel Inn. We have made reservations for December for Harambe and Tiffens at the Animal Kingdom. We had Sanaa on the list but my husband replaced it with the new Tiffen’s restaurant. WE also reserved Narcoossee which I am pretty excited about. Gosh, I love Disney food. It´s funny that you mentioned San Angel Inn, I lived in Mexico city for over 20 years and have also lived in the U.S. The San Angel Inn is owned and operated by one of the most prestigious restaurants in Mexico city, their food is authenthic, not Tex Mex but truly Mexican. It is expensive but worth the expense if you are ready to try purely Mexican food. This is actually my favorite restaurant in all WDW. I agree with H&V but we still do it every darn trip b/c we always have a Disney Jr-OBSESSED kiddo in tow. If not for those specific characters, I would skip this one. Reminds me of a truck stop diner. I agree with Sci-Fi. I was really disappointed it is a great atmosphere so well done. The food and service on the other hand not so good. I also agree with Via Napoli Yumm!! We had breakfast at the Crystal Palace and it was really good so I don’t know? Maybe you had lunch or dinner? We try different places every time we go and we use the same dining plan. We also love the food at WDW!!! I would add EPCOT’s Les Chefs de France to the list. My husband & I had dinner there & will NEVER go back. The $12 salad was good but the Seafood “soup” for $30 contained 2 shrimp. 2 scallops, 4 clams, a very tiny piece of unidentifiable fish and a teaspoon of very overcooked carrots & onions floating in watery vinegar! Awful! My husbands steak was cold & unedible. Service was poor. Never again. Good to know! We’ve never been there and I’m not sure if it’s because we’ve never had the desire to try French food, but still good to know. Thannks. My kids hated the Sci-Fi! Why? Because it was dark and those cheesy movie clips from the 50s actually scared them. I have to agree about Hollywood and Vine. I was SO disappointed!!!! It needs an update or something. I’ll agree with all… except San Angel Inn! I know it’s overpriced for what it is, but the romantic atmosphere can’t be beat. My husband and I go on lunch dates here a couple of times a year. I would add to your list that Chef Mickey’s is worth skipping. It is SO loud, and the food is blah.